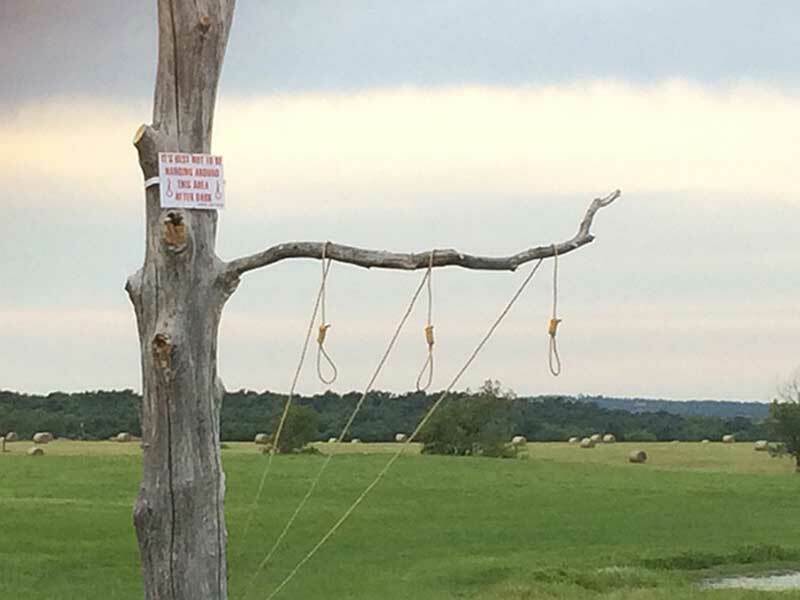 A controversial display was turning heads along a highway in Green Country, Oklahoma, on Sunday. "When I looked over there, I was like, 'are those nooses hanging there?'" said driver Terrance Reed, Sr. Reed was one of many who pulled over in shock, saying the display is a direct attack on his heritage. "If you think of a noose in America, it don't represent anything about but what used to happened to African Americans," he said. "He got the right to do what he wants to do, he's got a right to feel what he wanna feel, but I got a right to be angry about it too, and I'm angry." Other drivers throughout the day agreed. "It bothers me. It's humiliating," said driver Dennis Varner. "It's discrimination, and America shouldn't put up with it." 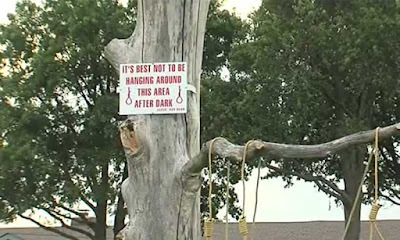 The owner, Merle Martindale, said he's been a victim of crime in the past. He said the sign is not meant to be racist, just merely a warning to any potential thief. But drivers like Reed say that's not the message the sign is sending them. "If you put up a sign that says I advise you not to hang around here after dark, you're making a statement," said Reed. But Okmulgee County Sheriff Eddy Rice says that Martindale wasn't breaking any law by having the display. 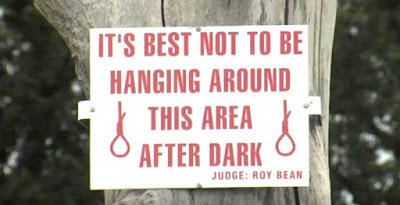 Martindale later took the sign and nooses down because he was concerned for drivers stopping to look. I'm white, and it looks like a direct message to blacks to me, too. It's Oklahoma, after all. Southern state.